ZERO produces a clean-tasting and highly refreshing drink with zero sugar and zero calories. The tabs contain light natural flavours with no artificial colours or preservatives. Simply drop a tab into your re-usable sports bottle and watch it rapidly dissolve. ZERO contains Vitamin C and 5 electrolytes, including sodium and magnesium. Vitamin C in ZERO supports a healthy immune system, protects the cells from oxidative stress and contributes to the reduction of tiredness and fatigue. Magnesium in ZERO contributes to electrolyte balance, reduces tiredness and fatigue, whilst supporting muscle protein synthesis. With minimal packaging, ZERO is environmentally friendly. The easy-break tabs mean that you can choose your ideal drink strength. You must be 16 years or older to purchase this product. 2 tabs = Strong.1 tab = Weak. Citric Acid, Sodium Bicarbonate, Sweeteners (Sorbitol, Sucralose), Malic Acid, Tri Sodium Citrate, Potassium Citrate, Magnesium Citrate, Natural Flavouring, Natural Colour (Beetroot, Carrot, Curcumin), Maltodextrin, Calcium Carbonate, Vitamin C, Green Tea. Should not be a substitute for a varied diet. Serving: 1 tablet. Max servings per day: 3. Do not exceed the recommended daily dosage. Keep out of reach of children. Excessive consumption may produce laxative effects. High5 Zero Berry is rated 4.2 out of 5 by 13. 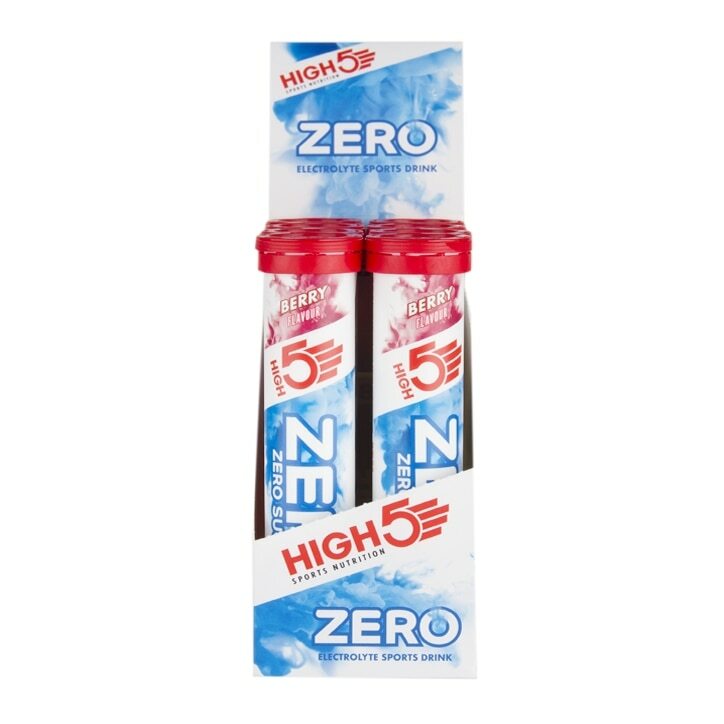 Rated 2 out of 5 by Anonymous from High5-High5 Zero Berry As the picture shows, i thought i was purchasing both the tube and the box. Rated 5 out of 5 by Pyproalla from Great taste, value and hydration! My husband and I go through a scary amount of these tubes so the big box provides excellent value for us. We use a whole tablet in a litre bottle to fuel a half marathon distance. I train up to 5 days a week so get few a fair few! The taste is delicate but noticeable and you know that your body is being protected by replaces the electrolytes/salt etc lost through seat. I recommend the Tropical flavour too. I couldn't go on without them. I use High5 gels during races as well.